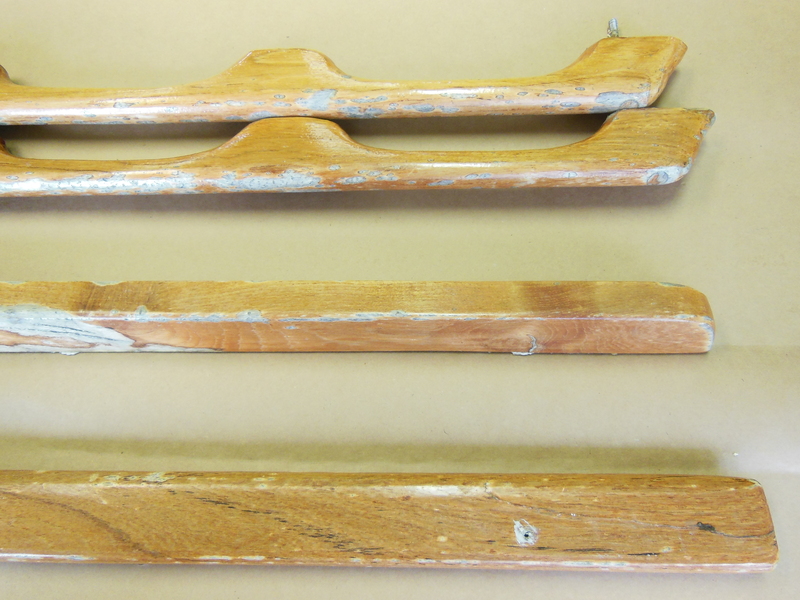 Is your topside brightwork weathered, worn, and sorely in need of refinishing? If so, this is one project that you’ve probably been putting off but you know it needs to be done. The job isn’t particularly difficult or expensive, it just takes plenty of time to do it right and to get good results. But after it’s done, it can be relatively maintenance free for years to come while looking stunning. Refinishing anything is a tedious, messy undertaking to do well whether it’s furniture or a sailboat. But the results are very gratifying when you get to the end. By the way, go over to my Interior teak restoration project if that’s on your to-do list. Who knows what evil lurks beneath your teak? Begin by removing all the exterior teak trim pieces. That sounds simple and it should be, but it can actually be the hardest part of this project. Hopefully, you’re not so unfortunate that a previous owner used 3M 5200 sealant/adhesive when they last refinished the wood. It does a really good job at being an adhesive! You might need to literally cut the pieces off the boat by working a sharp putty knife under the length of each piece together with a lot of careful pulling, prying, twisting, and patience. 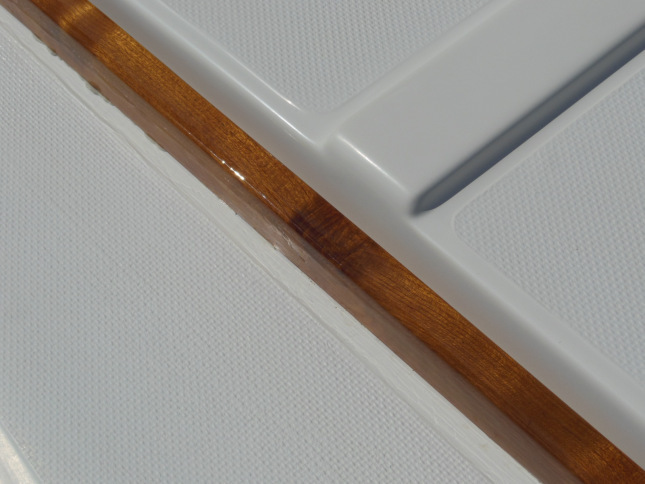 Parts can be so glued to the fiberglass that they can pull off some of the gel coat with it. So for your own sake and the sake of anyone that will ever have to work on your boat, don’t use 5200 on any parts that will ever have to be separated. Use the more forgiving 4200 formula instead if you must. Better yet, use Butyl tape, which never hardens completely and makes disassembly much easier. The next step is to strip off what is left of the old finish. If your brightwork was last finished with varnish, I haven’t found a chemical stripper yet that works any better, faster, cleaner, or greener than a heat gun and a sharp putty knife. Old finish comes off easily to reveal the sun bleached, weathered, and mildewed wood underneath. Use sandpaper to clean off the last bit of finish, damaged wood, and to smooth out deep scratches and chips. After you get down to solid, useful wood, the coloring might be uneven and some mildew remains in the wood’s pores. Bleaching will take care of both problems but don’t use laundry bleach. Don’t waste your time with Bartender’s Friend or expensive teak cleaning kits either. Instead, purchase some relatively inexpensive Oxalic Acid Crystals . Mix as much as will dissolve in a small container of hot water and follow the instructions to bleach once and neutralize three times. It might take multiple treatments this way to even out the teak’s coloring from the abuse it has suffered but it will get the job done. Finally, your wood is ready for you to start bringing it back to life. 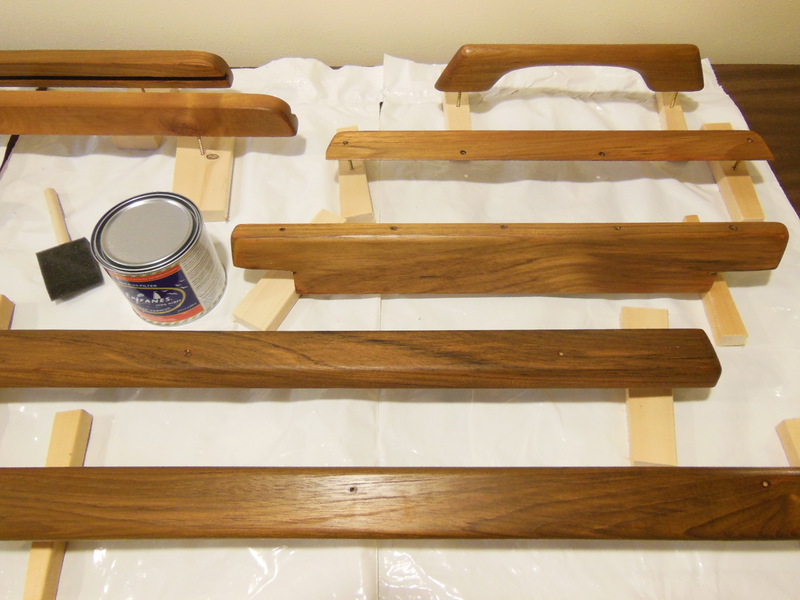 Begin by applying two generous coats of Dalys SeaFin Teak Oil . Those warm, rich colors that we love about teak will jump to the surface. Teak being a naturally oily wood, let the oil dry for several weeks before you wipe down everything with Acetone to remove any remaining surface oils so that the varnish will adhere well. To make it easier to varnish all sides of the pieces at the same time, see my tips on Simple jigs for varnishing parts. Every owner who has done this job seems to have their own personal favorite finish. I prefer Epifanes Clear Varnish . It leaves a hard, glossy finish. Apply the first coat of varnish thinned 50%, followed by one coat thinned 25%, one coat thinned 10%, and two coats unthinned. 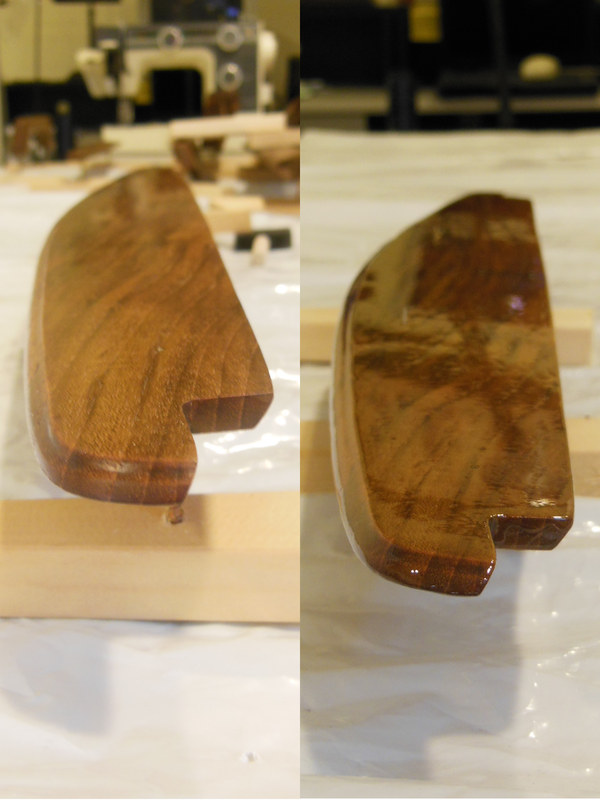 This technique makes the varnish soak into the wood and fills the grain for a smoother finish. Thick varnishes can be tricky to work with unthinned when they are the consistency of molasses. It helps to warm it double boiler-style over a hot plate. Lightly sand with a maroon Scotch-Brite pad in between each coat except before the last coat. For that one, wait two weeks for the varnish to completely cure before sanding with 220 grit sandpaper and then apply the last coat. Wipe everything with a tack cloth before each coat. For a Catalina 22, it can take all of two pints of varnish for the hand rails, hatch rails, weather board, crib boards, the companionway trim inside and out, and the winch cover panel. 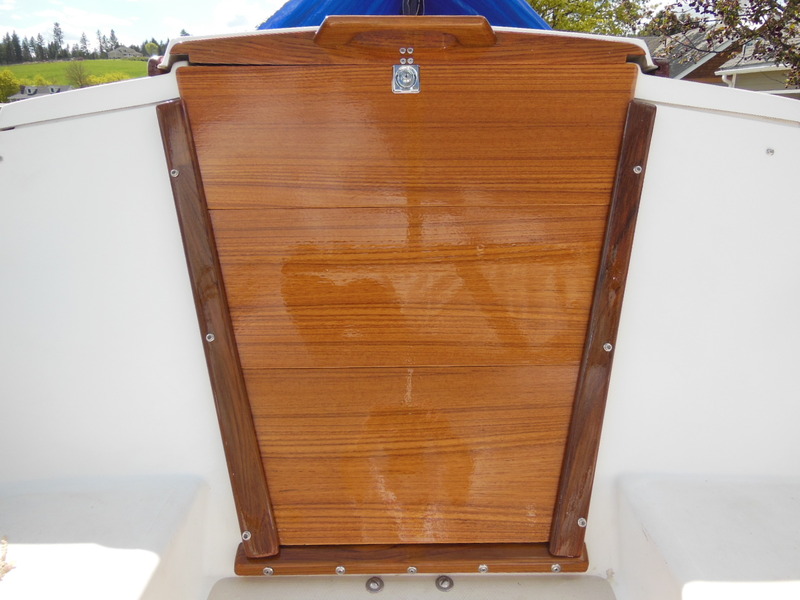 Depending on the weather, it can take weeks for the varnish to cure completely so wait before reinstalling the pieces and don’t take on this project if you plan on using the boat soon after. The edges of the crib boards wear first and are the places most likely for water to seep in and ruin them. So after the varnish has cured, mask off each edge about 1/4″ on the front and back of each board and brush a coat of slightly thickened epoxy on the edges. This gives them a hard coating that seals them completely and will protect them for many years to come. Just be careful to not build up the thickness so much that the boards don’t fit together anymore. Reattaching the parts is a downhill run. Just reverse the steps you used to remove them. Use Butyl tape at every joint between wood and fiberglass for a watertight seal. Then stand back and admire a job well done! Companionway hatch rails restored beautifully. Compare to the top picture. Where did you get your cylinder lock and lift ring? Is it a marine part of something meant for general outdoor use? I got the lock from Advantage Marine Supply on eBay but the same thing is available from several online retailers. Something else to mention: due to the length of the cylinder relative to the thickness of the front of the hatch, the tang on the lock isn’t flush with the inside of the hatch. There’s about a half inch gap that would make it easier to break into the cabin. I made up the difference with a small block of teak epoxied behind where you see the four hasp screws in the pictures. Still, if someone really wanted in, the could force the hatch open. The lock isn’t as stout as the original hasp. You might also consider replacing the tang with a longer and/or stronger one so that it wouldn’t bend as easily. The main reasons that I installed the cylinder is because we kept hitting our heads on the lock when the hatch is closed but the crib boards were out of the companionway. Maybe you keep your lock on the hatch too but cracked like we did so that it doesn’t get misplaced. This lock also prevents you from accidentally locking the cabin with the keys inside. Been there, done that. You can’t close this lock from the outside without the key, so problem solved. Plus, it just makes for a better looking installation, I think. Love the look of that lock, too. I used to keep my lock on the hasp also when not being used, but have since moved it so as to avoid the scars that are possible from banging forehead into it. One thing I’ll point out about having a lock requiring a key is the obvious potential to lose the key. I solved that issue by installing a lock that uses a 4 digit combination. Never a lost key now. OK…so I have been “thinking” about (or shoudl I say putting off) doing my teak on my Cat 25. After reading this post last weekend, it motivated me to start mine this weekend. I love the work you did on this and I am hoping mine turns out. I started with the tiller handle and pop top handle to see how difficult this is going to be and I must say it isnt as bad as I had been thinking. I have to wait till the weather clears up a bit to remove all of the other pieces now that I know its fairly easy. Using the heat gun to remove the old finish was the best tip!! Thanks! It makes it so much easier then using chemical or mechanical stripping means. 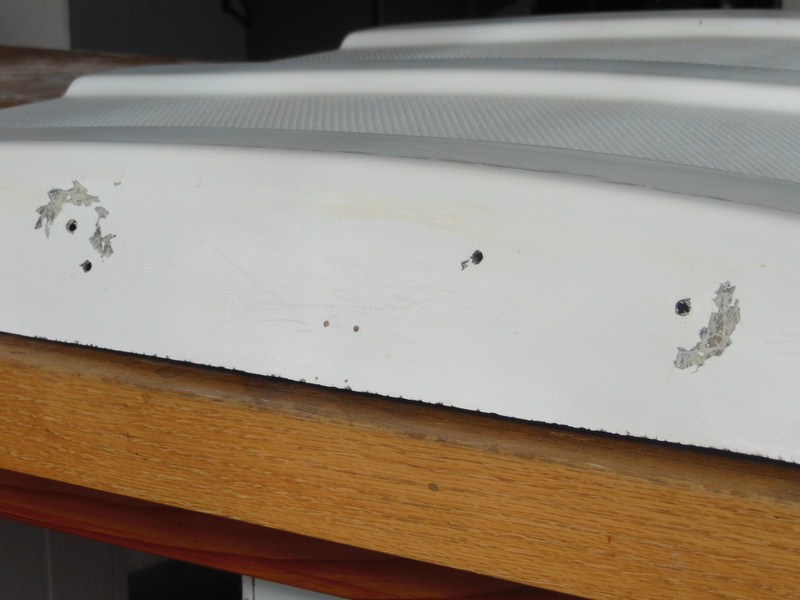 That was the part I was dreading, dealing with the stripping and thats why I was putting it off, but the heat gun made the stuff peel right off with the putty knife. Thanks for the tip!! Great site! Some of the things you have on here are stuff I already have done or on the bucket list for my boat. I’m glad the tip helped you to get over the hump of procrastination with your teak. I know too well what that’s like. Now that you know it won’t be a major chore, you should be able to work through it at a pretty good clip. When the oil and/or varnish go on and you see it come alive again, you’ll be anxious to get it finished. When you get done, leave another comment back here to let us know how it worked out! How is the edge treatment holding up? Sounds like a really good idea, the edges are where mine show the most wear. Did you put the epoxy on after the varnish or before? I now have two of my crib boards sanded down and working on the 3rd. It’s holding up really well so far, Mike. I’m glad I did it. In fact, if anything, the trim channels that they sit in are getting more wear than the boards now. I might give their wearing surfaces a coat or two of unthickened epoxy for good measure. Good luck on your boards! Glad to hear this site helped you! I’ve heard others who like Captain’s. I may have to try it on my next project. Thanks! Stingy: great website, very helpful. So, may I ask – did you choose wisely? It’s been a few years now and the finish is holding up really well. It still looks new and wet but that’s to be expected since up to now, I’ve kept my boat under cover when it wasn’t sailing. If I had to do it over again tomorrow, I’d pick the same finish. But any finish is going to look great when it’s that protected. However, we recently moved and starting this year, my boat will be in the water 5-6 months of the year so I’ll be watching to see how it holds up to more exposure to the elements. We have been looking at the teak on our boat for a few years now, but our biggest stumbling block has been the holes where the screws go. Most of the plugs are either lost or cracked, there are multiple diameters (none of which fit exactly) that we need, and I don’t know of a good way to get a plug perfect in height so it will fit and work once the teak is in place again. Any advice? Unless you need to replace the screws, you shouldn’t remove the plugs. They are just to hide and protect the screw heads from the elements. Just remove the nuts and washers on the underside and pull the handrails up leaving the screws intact. Refinish the wood and replace in the reverse order. If you do need to remove a screw for some reason or replace a damaged plug, carefully drill out as much of the plug as you can without enlarging the hole. A little hand carving might be necessary to get it all. Replacement plugs are available from most marine suppliers. Here’s a link to various sizes on Amazon. Glue the replacement plug in place, trim it flush, sand smooth, and finish as usual. Thanks, I definitely don’t want the extra work of replacing plugs. Unfortunately we’re missing a few already, so I am stuck with at least some of them needing to be replaced. Thank you so much for the advice! Are there any tools better or worse for trimming the replacement down as close as possible without (accidentally) damaging the teak next to it? 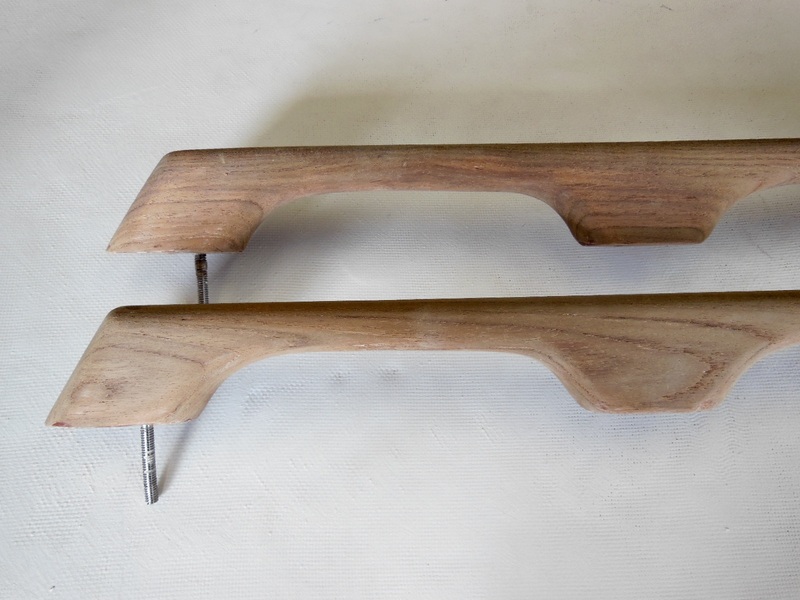 If you have woodworking tools or know a woodworker who can help you, use a fine tooth handsaw to trim off the excess plug to within 1/8″ of the handrail. Then use a sharp chisel or utility knife to round over the top of the plug almost flush to the handrail. Use two or three grits of sandpaper starting with the coarsest to sand the plugs smooth before finishing. Teak is very hard so use very sharp tools for the best results. It will also take more sanding than you might expect. But that’s why it’s used on boats, because it’s so durable (and beautiful)! A Forstner bit is what I use to drill out the plugs. I also use a plug cutter to make my own plugs from some scrap teak I have around. Put a little glue in the hole, tap in the plug, then cut flush with a flush cut hand saw and sand to any curve. You will have to touch up the finish in those areas, but it is actually fairly easy to do. That’s the right way to do it, Chris, IF you need to get a tool on the screw heads or replace the screws. 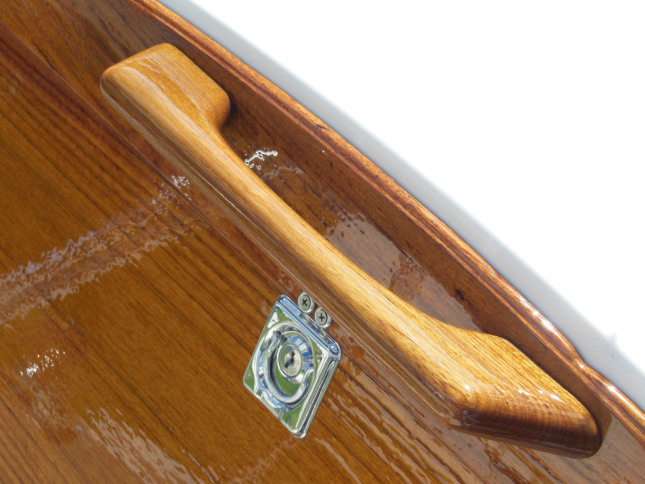 Many owners think that they have to do that just to take the handrails on or off for refinishing. In my experience, they come off just fine by removing the nuts from the underside without drilling. That is, so long as the heads are still glued solidly under the original plugs and don’t spin when you try to remove the nuts. Going unfinished is the lowest maintenance option but that means your brightwork becomes dullwork and not everybody appreciates it, especially for such beautiful and rare wood as teak. If you finish your teak like I describe in this post, it will last a long time if you maintain it. The varnish has built-in UV inhibitors but you should repair all deep nicks and scratches as soon as possible before moisture gets under the surrounding finish and causes it to blister or peel. When the finish gets worn enough, a fresh topcoat applied with the parts still on the boat may be needed to restore it to like new again. Even with that, you will need to refinish it all again eventually if you keep the boat that long. Wonderful! Thanks for giving me a sense of courage to take it on. I’m looking forward to making it look pretty (and keeping it that way with the varnish!) It is amazing how quickly the nice look faded last time I did the teak… looking forward to seeing the beauty last! I had been in the coatings industry for decades. I would suggest tenting and adding heat to reduce your stated weeks for individual coats on the wood. While I now live in Florida, we lived in cold country for 20 years where climate control was just part of the job doing coating projects. Makes life more FUN. Thanks for your great articles. We are newbies with a 1979 Catalina 27 as our boot camp boat. You might want to look at Belzona videos on YouTube. I am retired from sales but willing to help with projects. Great question. For the hatch rails and trim, in addition to donuts around the fasteners, I do apply a string of butyl near the edges all around the underside of the pieces to seal them as well. Otherwise, water can get trapped under the wood and work its way under the finish. From there, it can spread and loosen the finish all over the parts. The same can happen from dings and scratches in the exposed finish so it’s a good idea to touch up the finish when you can. Sealing the edges also keeps out dirt and bio matter that can breed mildew and moss. Hope you’re enjoying a great spring season up there in Nova Scotia and you’re getting out on the water soon if not already! I do not see how you were able to get all of your supplies for under $60. Did you steal the Epiphanes =^? 2 qts is +$70. Other than that, this is a pretty good tutorial on how to finish exterior woodwork. I picked up a copy of “Brightwork: The Art of Finishing Wood” a while back.One of the tips she gives on dried out teak is once the wood is cleaned and bleached, wet sand with pure tung oil to create a sawdust paste that will fill in the grain and reinvigorate the oily properties of the teak. For boats like a C-22, two quarts of varnish would last a lifetime. I used most of one 500 ML can for this project, which can be found for under $30. The oxalic acid crystals were only a few bucks and I already had some teak oil from the Refinish Your Interior Teak to Better Than New project. The hatch lock was the highest cost item but is optional. The rest of the supplies, I already had on hand as well: epoxy, sandpaper, tack cloths, etc. Mostly what you need for this project is plenty of time to do it well. Good tip on making your own filler paste. Severely neglected teak can be pretty rough and sanding down to solid wood can remove too much material. Your excellent teak story arrived today just a week late as I am just finishing off the job! Today I will applying the 4th coat of varnish on my teak tiller. It had been oiled (many times over) with olive oil and had gone dirty and sticky. Won’t do that again! While oiled teak is my favourite “look” I decided to use varnish this time. Three years on and the grab rails still look fine, so using the same stuff. I have long used oxalic acid as a cleaner/restorer and it came up trumps again with the true colour beaming through after several hard scrubbings and applications. A quick sand with 240 wet and dry. Beautiful colour, so did not oil. Indonesian teak, not Burmese. So far 3 coats of polyurethane marine varnish, and one more to come. Now here’s the thing: you recommend expo to build up the wear edges. But from my experience epoxy fairs very badly in UV. What protection for the epoxy to prevent it discolouring and eventually breaking down? 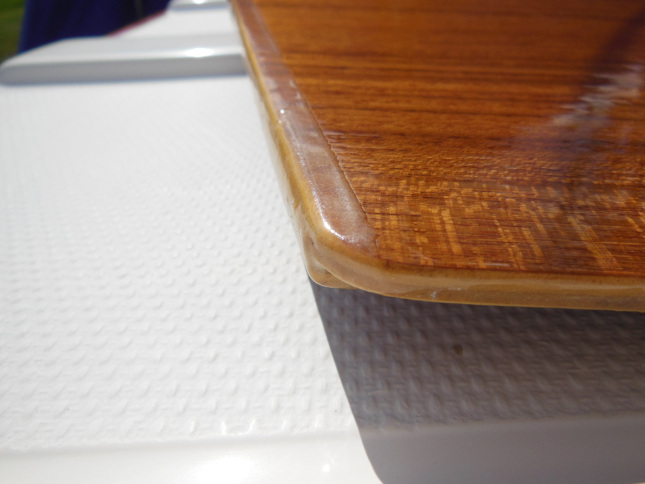 I used epoxy (Bote Cote) on the deck teak blocks that secure the spinnaker pole and it lasted just a year before going opaque and staring to flake off. What epoxy do you use that is UV protected? Thanks for these newsletters – keep ’em coming! I applied West System epoxy to the edges of my crib boards and have not noticed any UV degradation after 3 years. However, I do not leave my boat outside year round, the edges are not exposed to direct sunlight, they’re blocked by the companionway trim, and I also protect my companionway with this canvas cover when the boat is not in use. Your environment must be quite different. What might work for you to get the best of both worlds is to apply a good UV protectant varnish over the epoxy instead of epoxy over varnish. Any suggestions on removing the hatch rails on my 1979 Catalina 22? They seem to be “cemented” in place with very old sealant. I’m trying with a flexible putty knife and a hammer, but it is VERY slow going. Patience. Sharpening your putty knife may help as might a hair dryer or other form of low heat to soften the sealant. When it comes time to reseal them, use butyl tape and it won’t be nearly as hard the next time. Thanks! Patience was the key. I also found that putting a bit of mechanical stress for a while (even just leaving a putty knife wedged under the wood for a couple of hours) seemed to help loosen things up. Of course, maybe.the benefit was simply in me taking a break every once in awhile. In any event, I have now successfully removed all the external pieces and ready to start refinishing. Yes, I have a great big roll of butyl tape to use when I get to the re-installation. I love your site. It has been great inspiration as I take on the refurbishing of our newly acquired 1979 Catalina 22.